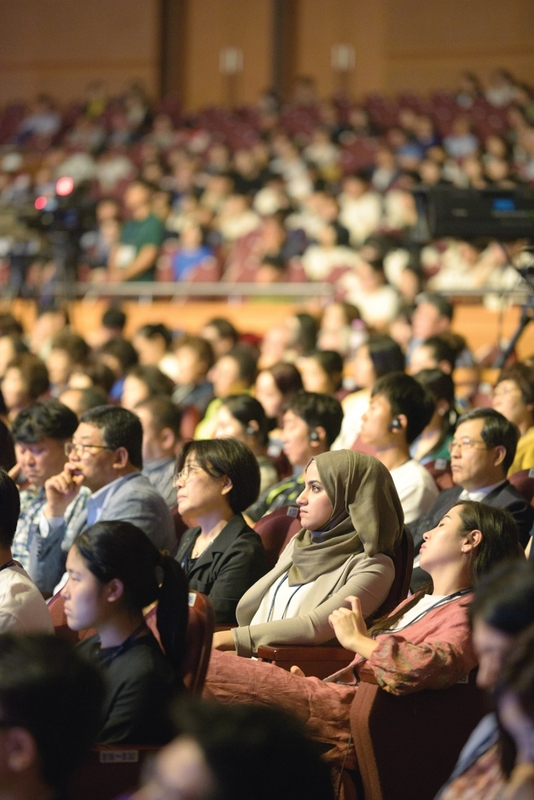 Held at the International Convention Center Jeju from June 26 to 28, the Jeju Forum for Peace and Prosperity 2018 focused on reengineering peace in Asia, a task as critical as ever in the wake of dramatic diplomatic developments in the region, including summits between the South and North Korean leaders and, perhaps most dramatic of all, the North Korean leader and the U.S. President. And as acclaimed novelist and Nobel laureate J. M. G. Le Clézio said in a prerecorded keynote address, the island of Jeju was an ideal space in which to reflect upon recent events and plot a path forward. 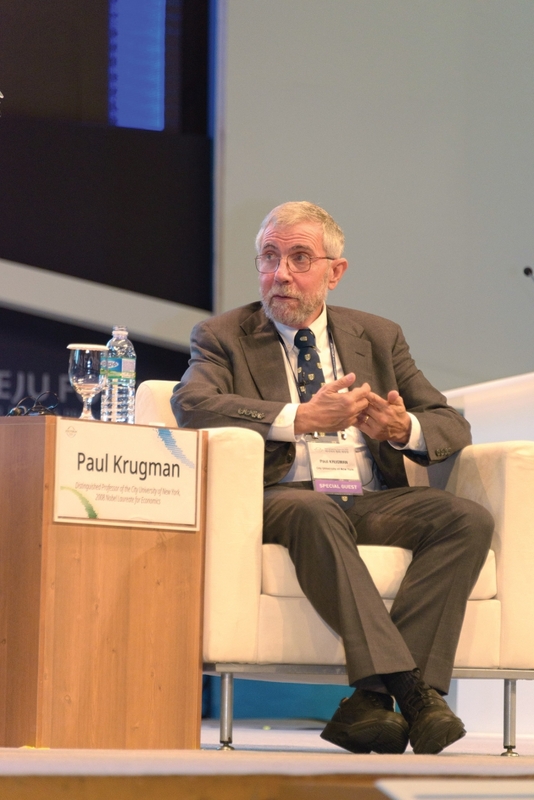 This year’s forum boasted a slate of inspiring speakers such as renowned economist and writer Paul Krugman, UNESCO general-director Audrey Azoulay, former East Timorese President and Nobel Peace Prize laureate José Ramos-Horta, former U.N. Secretary General Ban Ki-moon and former Japanese Prime Minister Yasuo Fukuda. Though much of the discussion was global, the forum tackled local history and culture, too. Two sessions in particular brought together artists, critics and other cultural figures to discuss peace, reconciliation and healing as Jeju marks the 70th anniversary of the April 3 Incident, one of the most tragic events in modern Korean history. 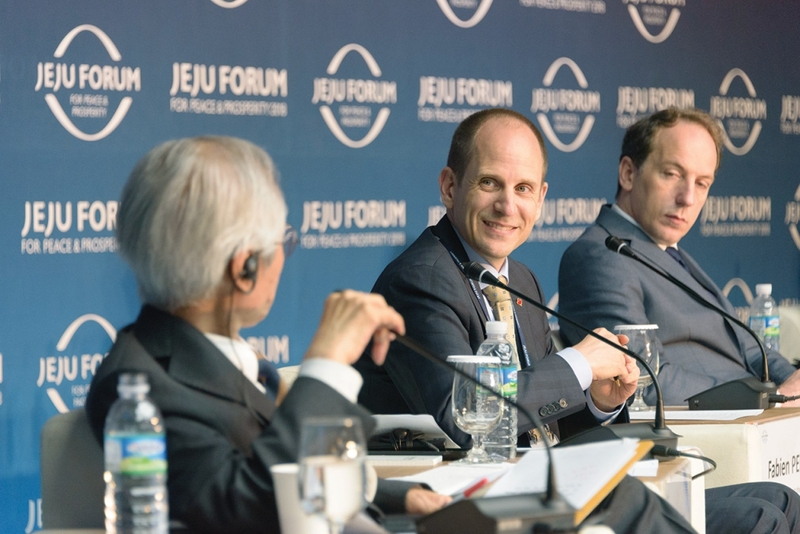 The Jeju Forum 2018 came at a time of great hope but also intense fear. Though much of the discussion at this year’s forum focused on the recent summits between South Korean President Moon Jae-in and North Korean leader Kim Jong-un and between Kim and U.S. President Donald Trump, the acrimonious G7 summit and concerns of a coming trade war weighed heavily on participants, too. The collapse in global trade could make the world poorer by two to three percentage points, with smaller economies particularly vulnerable. Krugman noted that unlike in a real war, a trade war can have no winners. “A trade war is more like an arms race, in which everybody wastes a lot of resources and ends up in the same place, except just poorer. Everybody ends up being worse off,” he said. In the afternoon, the forum hosted several events to mark the 20th anniversary of the 1998 agreement between Korean President Kim Dae-jung and Japanese Prime Minister Keizo Obuchi, an important milestone in the development of bilateral ties. It also hosted a panel of eminent scholars and diplomats who discussed Kim Jong-un’s recent meetings with the South Korean, American and Chinese leaders and what could come next. In the afternoon of the final day of the forum, two very interesting sessions convened, sessions dealing with issues much more local in scope. Sponsored by the local Jeju authorities, these gatherings gave audiences an opportunity to learn about the island, its rich heritage and the efforts taken to heal the scars of its often painful past. In the special session, “Path to Reconciliation, Coexistence and Happiness for Jeju Islanders,” journalist, author and Jeju Olle Foundation founder Suh Myung-sook, actress Moon Sori and Ewha Womans University professor Song Ki-jeong met to discuss how the island can overcome its past and chart a happier path forward. 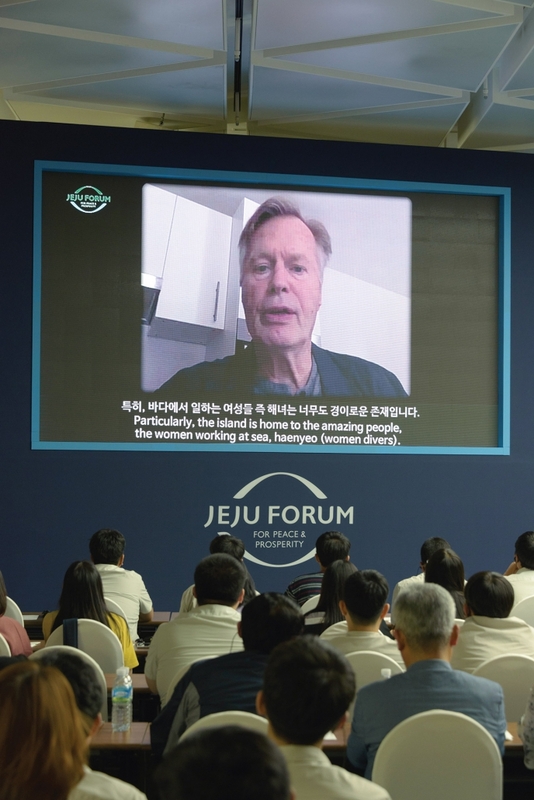 J. M. G. Le Clézio, the author of the novella “Tempest,” which is set in Jeju, could not attend for health reasons, but sent by video a prerecorded keynote speech. Song, who translated Le Clézio‘s “Tempest” into Korean, explained the author’s affection for Jeju, noting the island’s similarity to his birthplace of Mauritius. “It seems we can see Jeju and Mauritius reflected in his works,” she said. 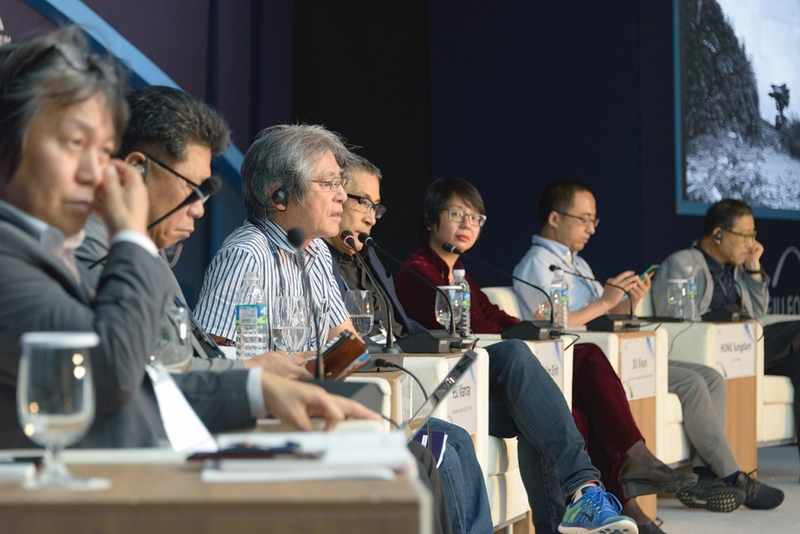 In the next session, “Networking Art and Peace Community in East Asia,” a panel of artists, critics and museum officials from Okinawa, Vietnam, Shanghai, Taiwan, Jeju and Gwangju discussed the role of the artist in healing scars from the past. In doing so, the participants — who hailed from places with painful pasts similar to that of Jeju — helped define the role of art on Jeju as the island builds its profile as a space of peace and culture. 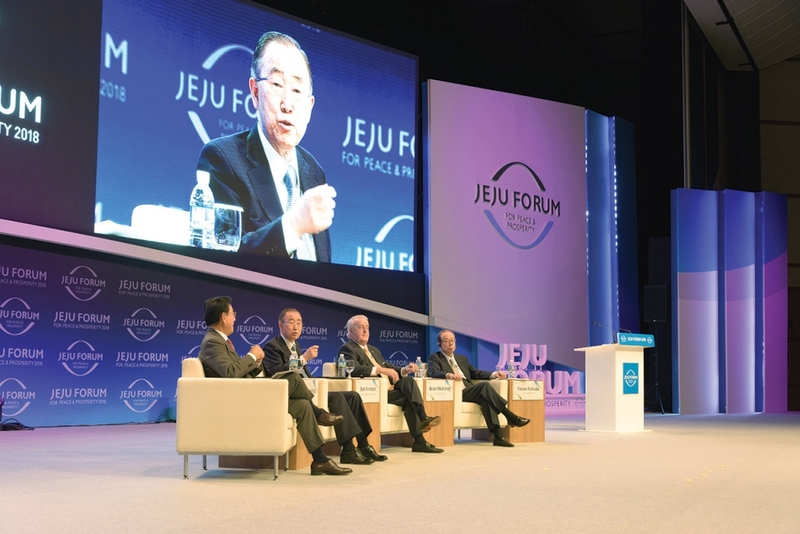 The Jeju Forum is a regional multilateral dialogue for promoting peace and prosperity in Asia. The forum serves as a platform for discussing and sharing future visions on sustainable peace and prosperity in Asia. Hosted by the Government of Jeju Special Self-Governing Province with the full support of the Ministry of Foreign Affairs of the Republic of Korea, the Forum was launched in 2001 as the Jeju Peace Forum. 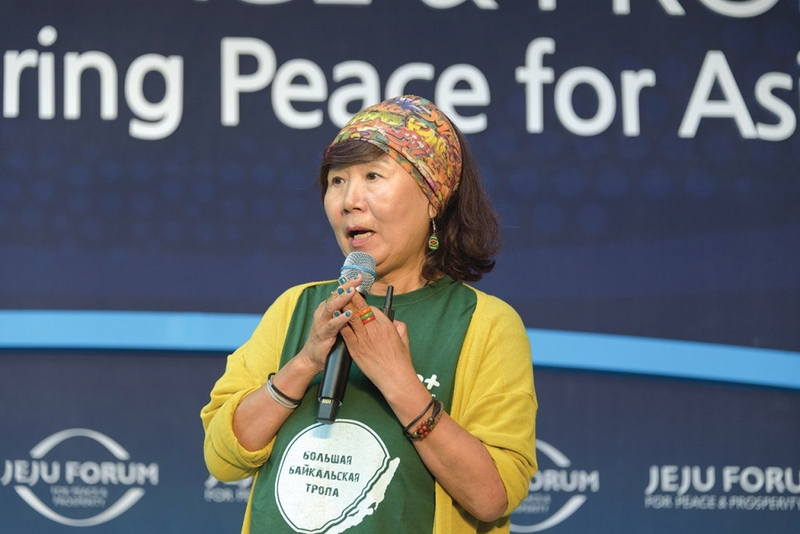 The forum was held biennially before 2009, and when it became an annual event in 2011, it was renamed as the Jeju Forum for Peace and Prosperity. Its Secretariat is headquartered in Jeju, South Korea. 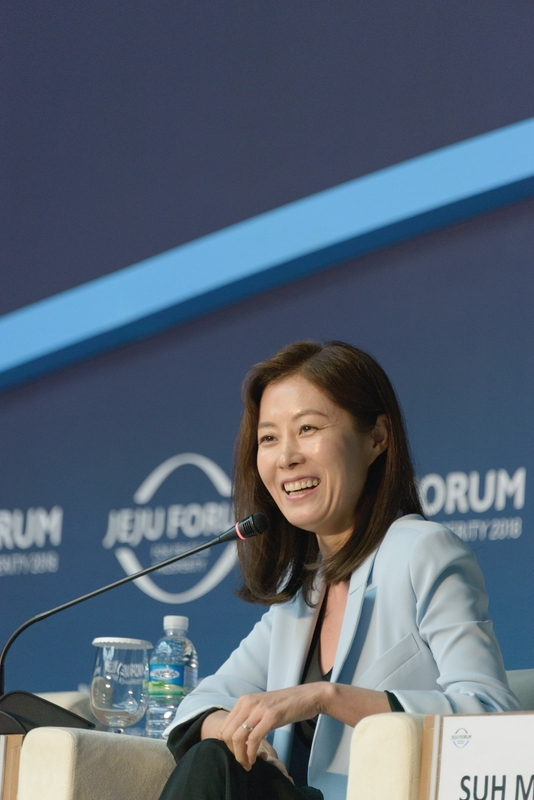 The Jeju Forum is held in May each year in Jeju with more than 60 sessions, including plenary sessions and various networking opportunities, thereby providing a great deal of insights to the world. Beginning on April 3, 1948, the April 3 Incident was a mass uprising against the holding of elections to be held in the southern half of Korea only to create a separate government, today’s Republic of Korea. The national authorities, then led by the U.S. military, responded with a brutal counterinsurgency campaign. By Sept. 21, 1954, when the crackdown ended, 10,890 people had been killed, the overwhelming majority at the hands of government forces. Over 4,000 went missing, and thousands fled the island. The incident was the second deadliest event in modern Korean history after the Korean War.